It’s always nice to pull up to a business and be greeted by a smiling face, isn’t it? Well, if you’ve ever pulled your car into our service bay, you’ve likely been greeted by the smiling face of our April employee of the month, Josh Dennison! Q. How long have you worked in the automotive industry? 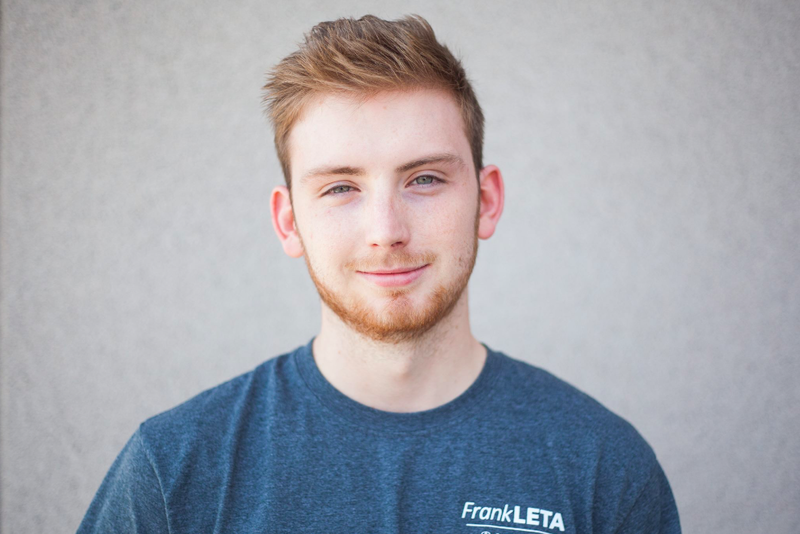 A. I’ve worked at Frank Leta for a little over two years. Q. What made you choose to work for Frank Leta? A. I needed a job at the time and just applied! Q. Name one thing you can’t get through your workday without. A. Making at least one customer leave with a smile. Q. What are the three most important things in life to you? A. Being happy, earning an income, and doing something I enjoy. Q. You’re on your lunch break and can eat at any restaurant in St. Louis–where would you go? Q. What’s your favorite thing to hear from a customer? A. That I was respectful and helped fix their issue. Q. You have a free Saturday–what do you spend it doing? A. Spending time with my girlfriend and enjoying the weather! Q. Finish this sentence: “If I wasn’t working in the automotive industry, I would be doing ______________”. A. I’m not sure; simply working somewhere to provide an income until I finish college. Q. What is one thing people would be surprised to learn about you? A. That I’m a very caring person. Congratulations on being named employee of the month, Josh! Want to get to know us more? Follow us on Facebook, Instagram, and Twitter! I am so glad you recognized Josh as a valued employee. It’s great to have him greet me when I stop by and pull in the garage! He is the friendliest ……and we always have something to chat about and he makes it enjoyable to stop by the dealership! He is most certainly worthy of the award! Thank you for the kind words, Dan! We love to hear that, Ron! Thank you! Josh is a very happy, pleasant person to be around . Love this guy…he has dated my niece for many years and he is one of the best……..